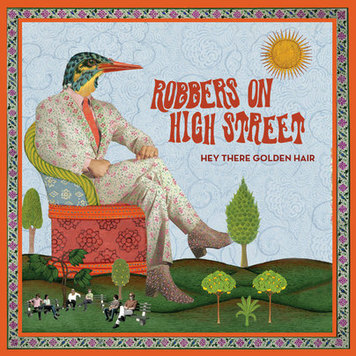 Robbers on High Street are a Brooklyn-based, rather large pop band who play a bracing mixture of indie rock, British Invasion and soul sounds that, in places, reminds me favorably of The Style Council. Apparently they've been through a few lineup changes since forming in 2002... On Hey There Golden Hair, it's a big group with a big sound - guitars, piano, harmony vocals, and they've thrown in the Dap-Tone horns for some extra flavor. It all goes together very well. Vocalist Ben Trokan really takes this band different places: Beatlesque baroque pop on lead track "Hollow Hill", a soft croon on "Electric Eye" (a little bit reminiscent of Wilco circa Summerteeth), ragged and plaintive in "Monkey", and, by God, positively Kinksian in "All Wires Are Crossed". I'm impressed. Can you tell? The band keeps up just fine, travelling through impeccable pop territory on "Hollow Hill" and "Face in the Fog" (which prominently features the Dap-Tone horns to great effect), and really driving hard on the urgent "Monkey"... all the way through to the impeccable power pop tour de force closing track, "Supernatural Shivers". If you like what you hear, I'd recommend going over and checking out the opportunity they've offered to download a free track, pledge and receive a free EP along with the album. Out September 13 via The Connextion and Pledge Music, and highly recommended. I think this is a beautiful pop/rock record. The Soul Corner - "Ain't That Peculiar"
My favorite of all the great Motown singers, and probably my favorite vocalist ever, is Marvin Gaye. Before the end of the year, I will come back and do a more in-depth Soul Corner feature on Marvin. Ellensburg, Washington's Star Anna & the Laughing Dogs is a rock/alt country band that is likely to garner a lot of recognition in the next few years. Formed in 2006, the band released a rootsy album named Crooked Path in 2010 that was well-received in the Pacific Northwest. In July the band released Alone In This Together, which retains a rootsy feel while amping up the rock intensity. The focal point is Star Anna's bruised, aching vocals, full of passion and devoid of contrivance. But the band -- Justin Davis, Travis Yost, Keith Ash, Ty Bailie (and Mike McCready of Pearl Jam played guitar on tracks 3, 5, and 7) -- provides the foundation that makes it work. This isn't a singer-songwriter project with hired musicians in the backdrop; this is a tight, organic music machine. Here is the album opening track, the restrained "Shine"
There are no weak tracks on this album, and it has about an honest a feel as you are going to find among recent releases. If you like Americana/alt-country rock, and especially if you like it dark, emotional and authentic, this band should be on your short list to check out. Ultimately, the test is in the music and your reaction to it. But it doesn't hurt to consider the opinion of others. In addition to considerable praise from the music press, one should give weight to the support (he financed the recording) of McCready and the faith of the great Rachel Flotard in signing the band to her Local 638 Records. Title track, "Alone In This Together"
Carly Crabb, a talented young Seattle photographer and friend of ours, made this engaging video of the Dave Matthews Band concert at the Gorge Amphitheater last Sunday. The great thing about it is that in just a few minutes it stitches together the vibe at the concert as well as showcasing the unique venue that referred to around here as The Gorge. There also is a sighting at the end of a flesh and blood member of the Rocksteady74 clan. "Desperate Dan (She told me she was single)" is a very good, and funny, song from the promising Scottish band John Wean that we profiled earlier this year. And now we have an amusing video to illustrate, at times in excruciating detail, the song. Consider it a public service especially for Americans who may struggle with the accent. "Try to Sleep" by Low is a beautiful song. The video starts out merely intriguing, but left me speechless at the end. OK, this one absolutely made me want to attend a Wild Flag concert. I suppose that's why it was made, but they may be happy to know that it worked. And by the way, Wild Flag is Carrie Brownstein, Mary Timony, Janet Weiss, Rebecca Cole, whose past associations, in addition to Brownstein's Sleater-Kinney, include Helium, The Minders, Croissant Cocktail, Feeble Knees, Quasi, Dogz, @@@, The Consortium, Asia, and Stephen Malkmus and the Jicks. Clearly, there are plenty of reasons to check them out besides the video. These ladies can flat out play. Letting Up Despite Great Faults is a Los Angeles dream pop/shoegaze band. Their songs are melodic and infectious, although the lyrics can take a melancholy turn--a perfect sound as summer slides into the fall. The members of the band are founding member Mike Lee, and Kent Zambrana, Chris Gregory, Matt Salas, Caitlin Dwyer. They use both electronic and acoustic instrumentation to produce their sound. 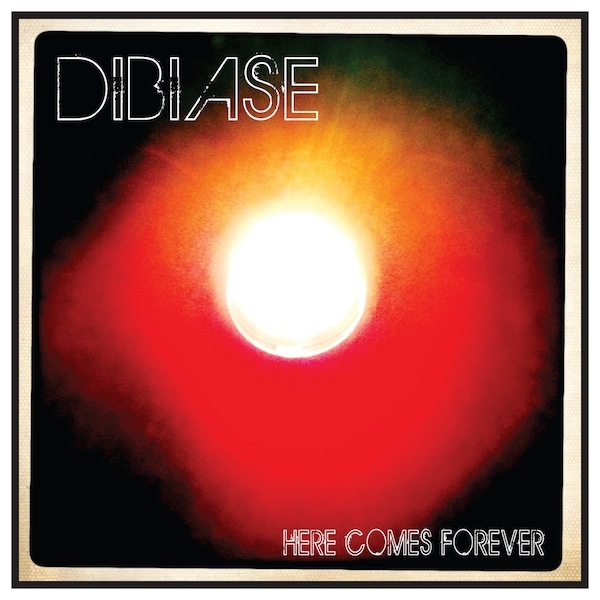 Dibiase is a strong instrumental four-piece from the Collinwood, Illinois (St. Louis area). When I say strong, believe me I mean it. This is real good heavy rock music, of the variety that you sometimes see referred to as "stoner rock": heavy riffs, great drumming and bass on the bottom, just real hair-shaking, head-bouncing stuff. They've got a new EP due out next Tuesday, Sept 13 which, based on these two tracks, I'd definitely recommend checking out. It's on a newly-formed label Earth Analog, which was started by Hum's Matt Talbott and also refers to the recording style. According to Talbot: The impetus for the label came from my desire to marry bands I liked with traditional analog recording methods in a real studio (In this case, my studio, Earth Analog). I know that doesn’t sound very exotic…but bands are now so used to working on computers and with unlimited tracks, editing, and processing capabilities. My studio offers an alternative to that. I still think tape sounds better than any analog to digital converter I’ve ever heard, and the track count and editing limitations put the focus squarely on the band, their songs, and their performances. I'll be looking for more from this group... and label. I love garage rock, I love surf rock, and I love punk rock. It should come as no surprise that I'm delighted to find a young band that combines two or more of those elements. Boise, Idaho's Teens combines all three. Teens are David Wood (guitar/vocals), Gabriel Rudow (bass/vocals), Christopher Kolody (guitar/vocals), and Dustin McFadden-Elliot (drums). They recorded their debut, Teens, in an underground bomb shelter outside of town with two mics and less than professional equipment. It has a bit of the old Black Lips loose energy, and if they can produce Teens under those circumstances, I think they can make a splash. Stream the new Girls album! The Hype Machine has made Father, Son, Holy Ghost, the new album from San Francisco's Girls, available for streaming. And here it is. Since the entire album is available to stream, and I've previously put up a video of one of the songs, I'll let you review the album for yourself. However, if you want my opinion, I think it likely is a top-ten-of-the-year album. Of course, I thought last year's EP and the prior LP were top ten albums as well. And I'm never wrong. The album is available on September 13. As I was listening to the various Natalie Pryce tracks available on Soundcloud, I was musing about how to describe a band that has been described (according to their own Facebook page) as 'a tirade of obscene poetry', 'more psychotic than pornographic', and 'Bosch meets Kafka at a crack party in Islington'. And then I realized that listening to Glasgow's Natalie Pryce in 2011 is like listening to the Monks of the 1960s, if the latter band had grown up in this century and resolved that Velvet Underground nihilism was a more comfortable artistic voice than proto-punk. So there you have it. The band is comprised of Mark (Misc), Greg (Guitars), Litts (Bass), and Stephen Coleman (Drums). Edinburgh band The Last September is taking an unconventional approach to potential success. After their first album, Vagrant Song, they put the band on the shelf for five years. Now they are back with their second album, As the Crow Flies. The band's sound is indie rock with a folk edge, and is distinguished by beautiful songs. The band consists of Pete Deane, Dave Bishop, Calum MacLeod, Jos Collins, Ali Petrie, Poppy Ackroyd, and they have no label at this point. Glasgow band Aggi Doom plays music they call darkwave, which seems to be a somewhat more darker version of '80s new wave. I say it "seems to be" rather than it "is" because I don't have much of a musical record for evaluating the band. However, what I've heard is good and interesting. The band members are Claudia Nova (vocals, keyboard), Hillary Van Scoy (vocals, guitar), Joan Sweeney (vocals, bass), and Scott Caruth (vocals, drums).